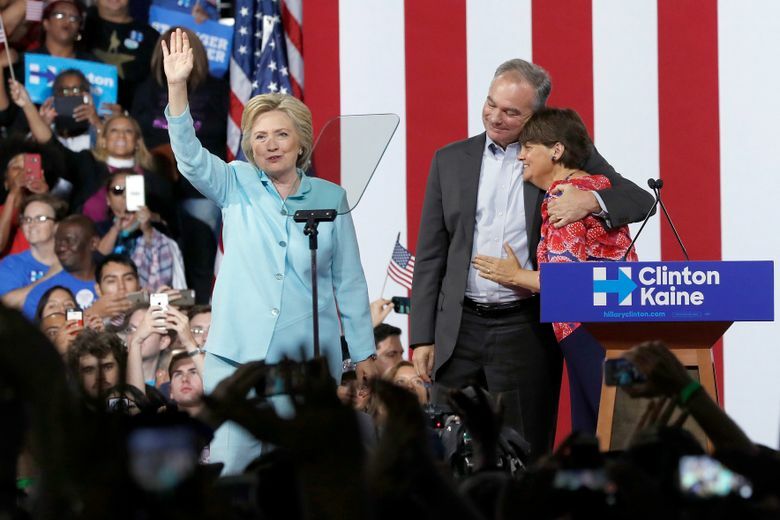 WASHINGTON (AP) — It’s Hillary Clinton’s turn. The Democratic National Convention opening Monday in Philadelphia is Clinton’s chance to hit reset after a vigorous primary against Bernie Sanders and the unlikely movement that formed behind the Vermont senator. Sanders, a self-described democratic socialist, has endorsed Clinton, but many of his supporters have not. Some were dismayed by her choice of Sen. Tim Kaine, D-Va., as her running mate. Democrats had expected a smoothly choreographed display of party unity that would contrast with last week’s Republican National Convention in Cleveland. That gathering exposed deep, lingering reservations about Donald Trump from within his own party. But Democrat’s hopes were dashed Sunday when DNC Chairwoman Debbie Wasserman Schultz resigned under pressure over hacked emails. Both parties use their national conventions to formally nominate candidates for president and vice president. Party leaders showcase their nominees, and the prime-time speeches by the candidates and prominent politicians win some of the largest television audiences of the campaign. That makes the convention a critical opportunity for a party to introduce its candidates to the country. Democrats also will adopt its platform, which lays out policy principles but has no binding effect. 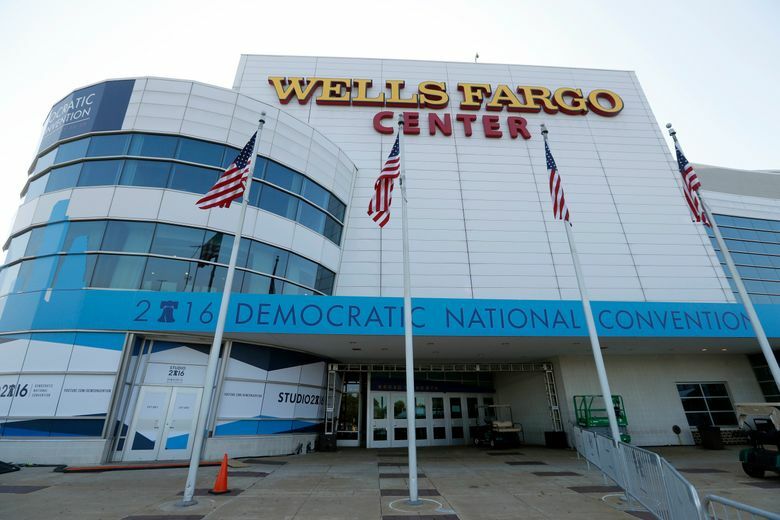 The Wells Fargo Center, home to the NHL’s Philadelphia Flyers and the NBA’s Philadelphia 76ers, is the convention site. The arena has been transformed with stages, platforms, cameras and lights. Democrats are hoping that city’s historical role in the founding of American democracy will serve as a powerful backdrop for the themes they’ll highlight. 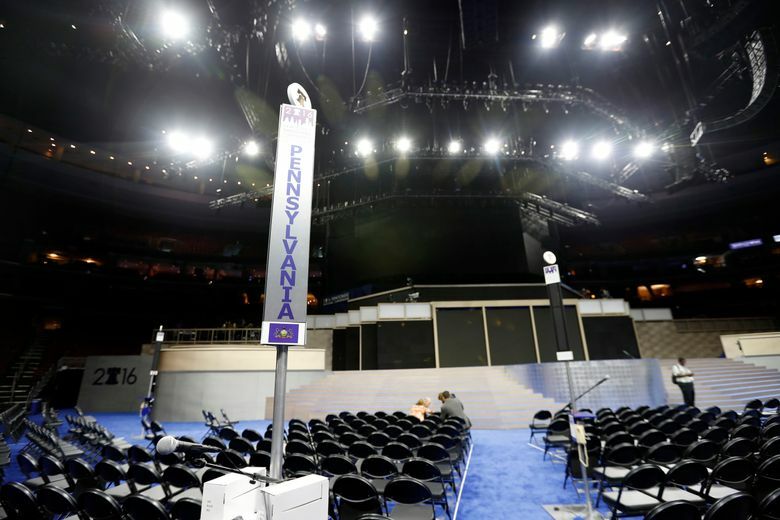 More than 5,000 delegates are among the 50,000 people set to be in Philadelphia. They include alternates, lawmakers, special guests, journalists and protesters. Among the delegates, about 15 percent are superdelegates, mainly members of Congress and members of the Democratic National Committee. At the GOP convention, a striking number of prominent Republican lawmakers and party leaders were nowhere to be seen, including the party’s previous two presidents and its two most recent presidential nominees. In contrast, bold-name Democrats have been eagerly vying for a chance to speak in Philadelphia. Most Democratic senators and House members are expected to attend. The convention was rocked Sunday before it even began by fallout from 19,000 hacked Democratic National Committee emails published online, some suggesting the party favored Clinton over Sanders in the primary. Wasserman Schultz, long accused by Sanders of rigging the primary for his opponent, said she’ll step down at the end of the convention. But first she’ll formally open and close the convention, and address delegates. Her abrupt ouster triggers a new race for leadership of the party that is likely to play out on the sidelines of the convention. First lady Michelle Obama is set to speak Monday. That’s also when Sanders will give his speech — a closely watched moment for signs of whether his loyal supporters will line up behind Clinton, as he’s asked them to do. Former President Bill Clinton, the candidate’s husband, is the speech to watch Tuesday. A day later, President Barack Obama and Vice President Joe Biden come to Philadelphia. On Thursday, the final night, Chelsea Clinton will introduce her mother for her speech accepting the Democratic nomination. Kaine, who made his debut as Clinton’s running mate at a joint appearance Saturday, will give a speech introducing himself to the country. Officials haven’t yet said when, but the running mate typically speaks Wednesday. Other scheduled speakers are Massachusetts Sen. Elizabeth Warren, New Jersey Sen. Cory Booker, New York Mayor Bill de Blasio and House Minority Leader Nancy Pelosi. On the eve of the convention, the organizing committee announced that the Rev. Jesse Jackson and retired Gen. John Allen will also speak. Snoop Dogg, Lady Gaga, Lenny Kravitz and Cyndi Lauper will appear in Philadelphia during the convention. Fergie will perform at The Creative Coalition’s gala. States will get a chance to announce how their delegates are voting in the formal roll call Tuesday. It’s a high point for Sanders delegates; they’re pushing to have their votes fully tallied. In 2008, Clinton halted the roll call midway through to call for then-Sen. Barack Obama’s approval by acclamation, or unanimous vote. Sanders says he favors a state-by-state roll call, but he hasn’t indicated exactly what he will do. There’s a total of 4,763 delegates. It takes 2,382 to win the Democratic nomination. Clinton arrives in Philadelphia with 2,814 delegates to Sanders’ 1,893, according to an Associated Press count. That includes the superdelegates, who can vote for any candidate they choose. This year, those superdelegates overwhelmingly backed Clinton. The remaining 4,051 are pledged delegates, won by the candidates based on the results of state primaries and caucuses. If there are any fireworks in Philadelphia, expect them to come from Sanders supporters. They have said they plan to show up in full force. Philadelphia officials estimate between 35,000 and 50,000 people will demonstrate across the city each day. Activists have put the estimate higher, at roughly 100,000. Among the groups planning to demonstrate are gun control advocates, the group Occupy DNC Convention and Trump supporters from Pennsylvania.